Genes Vs Routines… Skin Ageing – How Much Can We control and How Much is Pure Genetics? 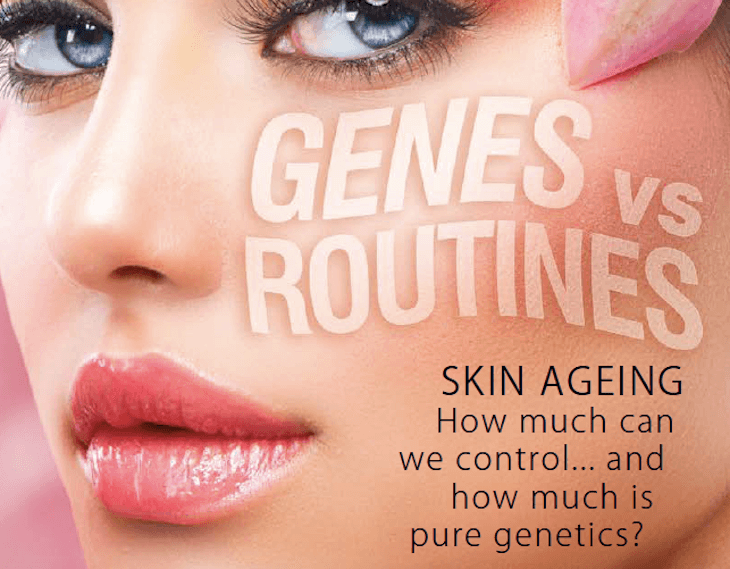 You are at:Home»Print Magazine Articles»Genes Vs Routines… Skin Ageing – How Much Can We control and How Much is Pure Genetics? Our skin is the biggest organ in our body. Since it sits on the periphery, it’s our first form of defence from any external (outside) influence, while being the first step of our immune system. It is also the last to receive nutrition from within, with our major organs taking the majority of nutrient value that is ingested – and then sending what is not used to the outer layers and skin.Having clarified the above, you can imagine how much work the skin does with minimal support – especially when our bodies are not in optimal condition. So what does this mean for skin ageing? How much can we control? We refer to intrinsic and extrinsic ageing factors… and of course genetics. All three of these play a role in how the skin ages. Genetics fall into the intrinsic ageing factors (these being the influences from within the body that play a role in how the body and skin ages), for example: hormonal activity, stress, medication, illness and/or disease will all influence in various ways. Extrinsic factors refer to those influences that come from an outside source, for example: sun, environment, skin products and so on. Is it genetics… or wear and tear? In this day and age we cannot rely on genetics alone to see us through the ageing process. I’m not saying that those of us fortunate enough to be bestowed with “alpha” genes won’t age better than those not… we will! But with the amount of external and internal damages increasing, we have to be more diligent and knowledgeable about our skin and how we care for it. Genes will only get you so far, they aren’t going to protect your skin from drying out when exposed to numerous Highveld winterswith zero humidity. They aren’t going to stop the fine lines and wrinkles from forming due to dehydration setting in as the ageing process unfolds. They aren’t going to protect you from the damaging and very ageing UV rays that we are exposed to on a daily basis. Good genes will certainly assist the process of ageing and we see that not only with genetics but with different ethnicity. For example; a black skin will age at a much slower rate than that of a white skin, as is the same for a Mediterranean skin. These skins have a higher oil content and so are able to hold onto moisture longer, which keeps them hydrated and slows down ageing. Lastly – what about our lifestyles? Someone working outdoors will age faster than if they worked indoors. A heavy smoker will age faster than if they didn’t smoke at all. A body that is not being feed a healthy lifestyle that includes balanced eating, regular exercise, a good sleeping routine and plenty of water will age faster than if it was in better shape. And believe me, your skin will be effected by this. We also need to consider that what we see on the surface is supported by a very extensive underlying structure. The skin and the underlying muscle and tissue need to be treated very differently. A skin care therapist will be able to ensure improved skin appearance for the surface. They will be able to stimulate the activity just below the surface to improve cell regeneration, assist in undoing sun damage as well as a host of skin rejuvenation processes. But, they are just working on the skin! A surgeon on the other hand will be able to have effect on the muscle and underlying tissue to assist in lifting, removing excess skin and plumping areas where fat (yes fat that gives our face its plumpness) has depleted. We have to consider many different factors that can slow down or speed up the skin ageing process. We must remember that every person and their body, is different to the next. Each body will function differently and so will the ageing process then differ from person to person. It is clear that there are certain factors that we can indeed control to help slow down this ageing process. I suppose what it boils down to is this: How much are you prepared to do? It is important to find real and possible solutions for you and your skin as it ages – and not follow theconstant barrage of “social sheep” in choosing your preferred skin care brand, treatments and/or surgery. You need to find a skin care clinic, therapist or possibly a surgeonthat you trust and who can provide you with the solutions you are looking for, within your budget. There is so much out there that can be done. I say arm yourself with knowledge on what is available and start slowly. Have an open mind and stick to what you are comfortable with and again, not what “everyone else” is doing! A2 Disclaimer: This article is published for information purposes only, and should therefore not be taken as an endorsement or advertisement for any product or medical treatment – nor should it be regarded as a replacement for sound medical advice. This article was written by Ingrid Katz and edited by the A2 team EXCLUSIVELY for the A2 Aesthetic & Anti-Ageing Magazine September 2015 Edition (Issue 15). 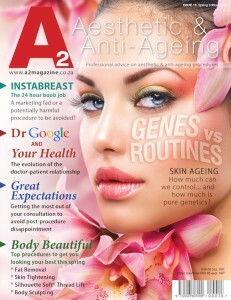 A2 Magazine prints only four magazines each year – reporting seasonally on everything you need and want to know about aesthetics, anti-ageing, integrative medicine, quality and medical skin care, cosmetic dentistry and cosmetic surgery in South Africa – where to go, who to see, what to expect, something new and so much more! Never miss an edition – click here for more info about where you can buy the print and/or digital copy of A2 Magazine (including back copies). To make use of any of our content for re-publishing, you must contact info@a2magazine.co.za for approval. Skincare therapist, Director of Pure Aesthetics. Ingrid qualified as a skincare therapist at the Isa Carstens Academy in Stellenbosch. With several years’ experience in the industry, she established Pure Aesthetics alongside Dr Doucas, a plastic and reconstructive surgeon at the Netcare Linksfield Hospital. Her primary objective for each client is establishing optimum skin health. From there, she is able to more effectively treat specific skin concerns. Ingrid focuses on non-surgical anti-ageing treatments, complementing the surgery performed by Dr Doucas – and is also on the expert panel for a leading medical skincare brand.